Mr. Packer said it is difficult to know how the corruption crackdown will ultimately impact Macau where Crown Resorts derives nearly half of its earnings from Melco Crown through a 34 per cent stake. "Obviously the slowdown in Macau is more severe in truth than any of the operators foresaw. I don't think any of the operators could have predicted what has happened now," Mr Packer told CNBC. "As an Australian investor in China and Macau, it's very hard to be critical of a corruption crackdown..but when and how that ends is something that no one knows." Industry figures released earlier in May showed gross gaming revenue in Macau fell 39 per cent in April to 19.2 billion patakas ($3.04 billion). While last month's figure marked 11 straight months of decline, the rate of losses has slowed in the last two months. "Clearly it would be better if there was more visibility on that and again the market is down considerably from where it was," said Mr Packer. "But all we can do as operators is to build the best product we can." Melco Crown chief executive Lawrence Ho said he hopes to have a minimum of 400 tables at Studio City to make the 1600-room resort work. 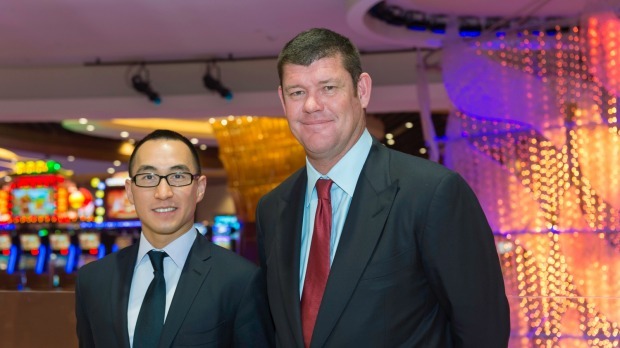 Mr Packer and Mr Ho were speaking at the opening of the Nobu hotel at Melco Crown's City of Dreams casino in the Philippines on Tuesday.